The title of this post comes from a Georgia O’Keeffe quote. For many years, I taught fourth grade in Wisconsin and we always had a unit on famous people from Wisconsin. Georgia O’Keeffe was born in Sun Prairie that is not too far from the capital Madison. I’ve often marveled at her pieces of art, the simplicity of an object found in nature. So when Christine Valters Paintner used this quote, naturally it caught my attention. “Nobody sees a flower really; it is so small. We haven’t time, and to see takes time-like to have a friend takes time.” This week after reading more of Christine’s book, Seeing with Eyes of the Heart, it was time to take out my camera. I’ve always loved taking pictures, not with any expertise but just enjoyed it. I’m the one who after coming home from a vacation or hike has hundreds of photos of random objects everything from rocks to people. So this past week, I walked around my yard looking for a “random” object. 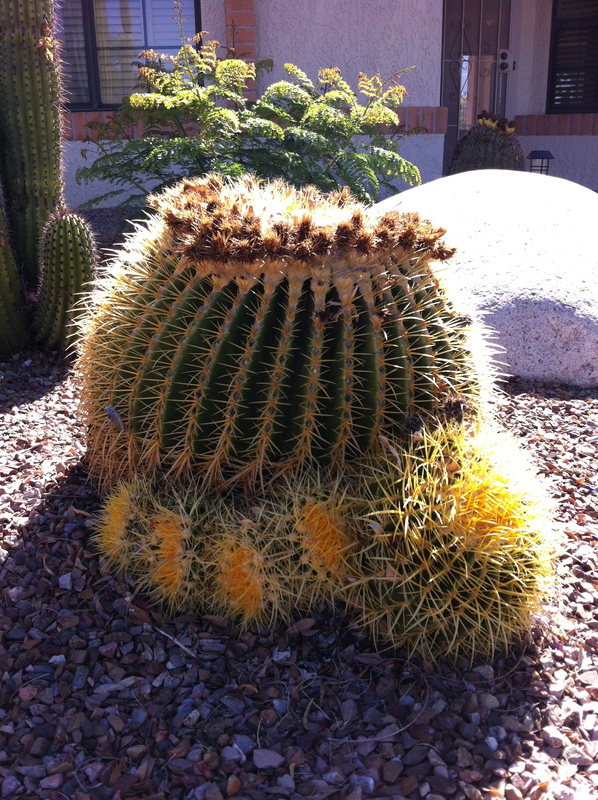 Living in the southwest, my eyes immediately spotted a golden barrel cactus that has a number of “babies.” Perfect! Setting out to be reflective, slow, deliberate, aware and simply be, I was ready. As you can see there is a nice sitting rock right behind the cactus, this was my spot where I could slow down my breathing, and close my eyes. 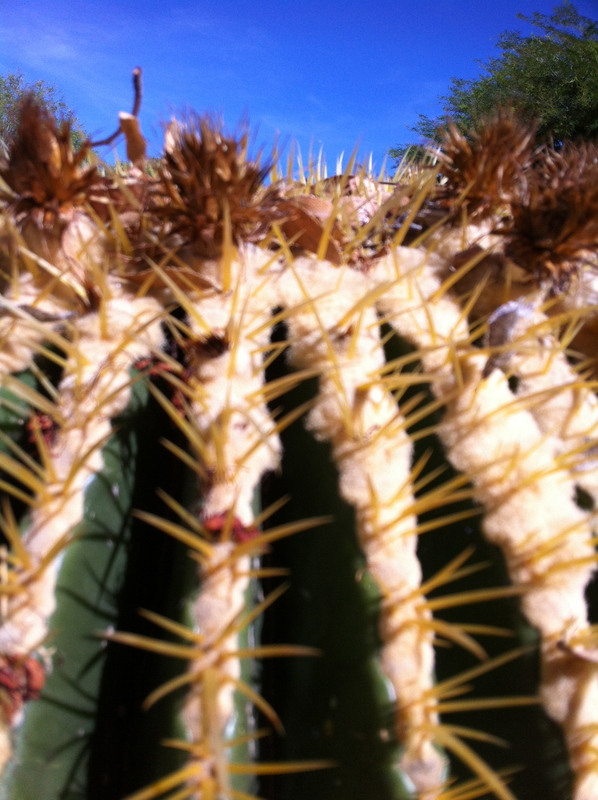 As I opened them, I looked at my surroundings, initially seeing this cactus as a whole object with the yellow thorns and numerous “babies.” Then I started taking some pictures; I noticed the variation of colors and shape of the thorns. Once thought of as something to stay clear of, now suddenly became an object of beauty. 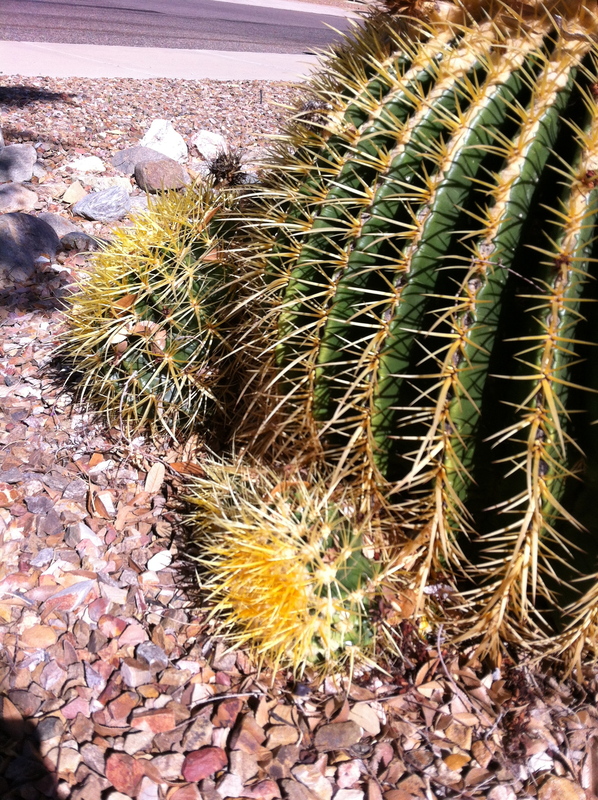 The babies seemed to have even more of an abundance of thorns – I saw that as a symbol of protection. 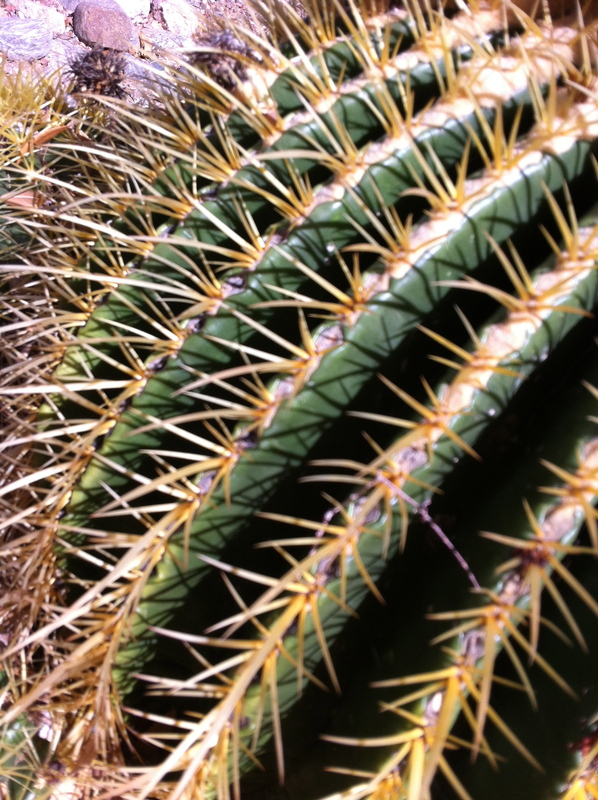 How all the small cacti were so close to the main plant – well I couldn’t help think of a mother protecting her children. As Christine suggests, when I completed a set of photos, it was time to sit silently again, close my eyes and just be in the presence of God. 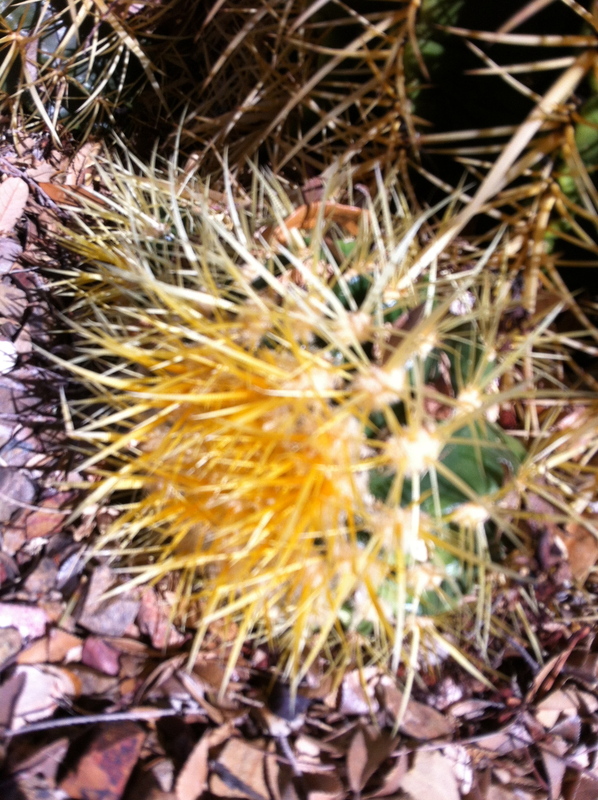 I found myself being grateful for so much more than this cactus, all the beauty found in nature, people in my life and even our new rescue dog. Connecting photography and nature to a place of reflection, prayer, meditation and being more contemplative has a comfortable place in my heart.